ChipBLASTER Destroys Machine Tool Downtime! In response to customer demand, ChipBLASTER has engineered a unique Sludge Settling Tank for use with their new Cyclone Filtration. This means that you no longer need to shut down your machine tool for cleaning or to change filters as there are NO FILTERS. These new products are manufactured by ChipBLASTER at their Meadville, PA manufacturing facility. Customers cutting really dirty materials are constantly shutting down production to clean their machine tool sump and change filters. In addition, they often scrap tools and parts due to contaminated coolant. Some applications are so bad the coolant lines actually get clogged with particulate. This is now a thing of the past thanks to ChipBLASTER’s new Cyclone Filtration and Sludge Setting Tank. ChipBLASTER’s new Sludge Settling Tank was engineered with special baffles that create a unique flow path through the tank.This unique flow path reduces the velocity of the fluid, meaning that it takes 10-12 minutes for the discharge flow to reach the other side. 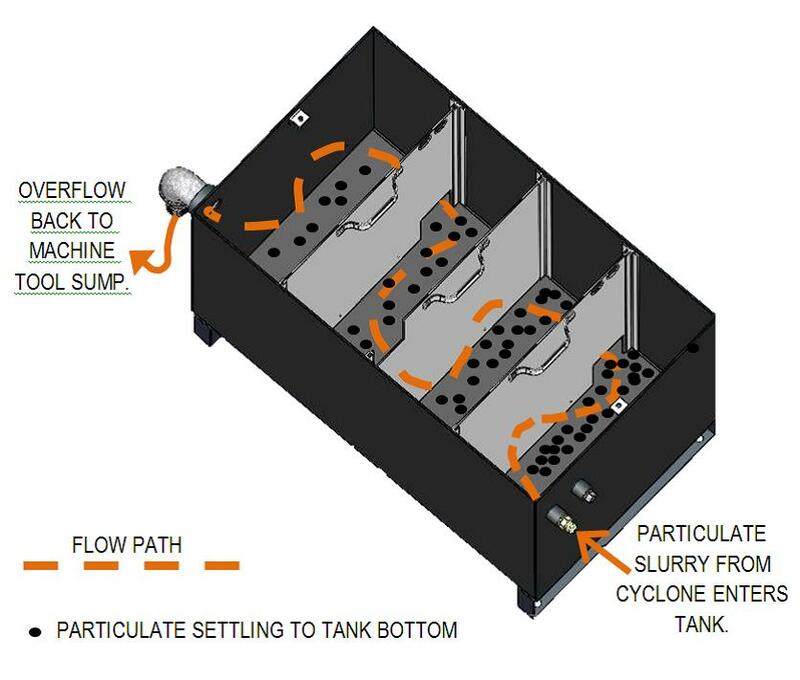 By the time the flow reaches the exit port, the majority of the particulate has settled to the bottom of the tank resulting in clean coolant being discharged back to the machine tool sump. ChipBLASTER’s Sludge Settling Tank works extremely well. particulate. This can all be done without any downtime as the machine tool continues to run. “The tank is easily accessed and therefore, easy to clean. It eliminates the need for filter bags and is a lot easier to clean than a sump. Also it collects all of the sludge and precludes it from being re-introduced into the sump. 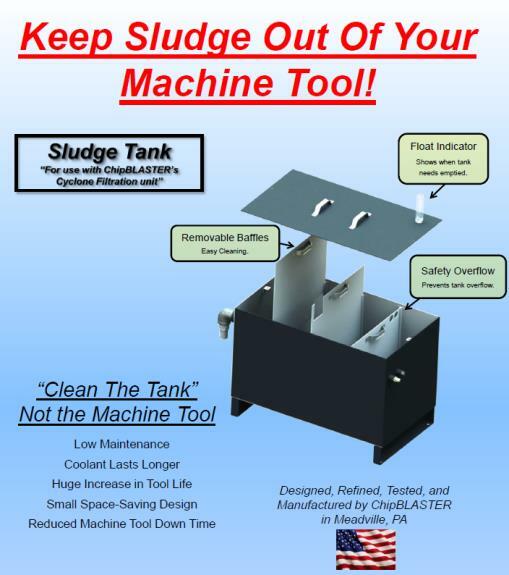 For more information, contact ChipBLASTER at 1-800-241-3163 or email sales@chipblaster.com. ©2017 ChipBLASTER. All rights reserved.